Select the Golf page and scroll down: You’ll see many options for unique golf gifts, whether for a tournament, a company event, a special touch for your golf lovers’ wedding, or just for a birthday, anniversary or holiday gift. Tags, boxes and frames are featured here, but you can also select ornaments or coasters for personalizing a golf-related gift. Hosting a corporate event and looking for an affordable way to articulate your company value? 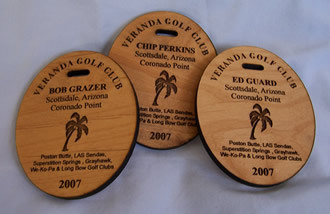 We make golf tags, either leather or wood, featuring the image you email to us and the fine laser design work we’re known for. These tags make fine corporate holiday gifts or mementos for other golf-related corporate events. See the pricing chart and note the big savings guaranteed with larger orders. 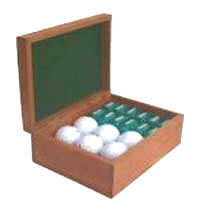 Cherry wood, felt lining, invisible hinges and custom engraving: With features like these, you may expect golf ball, wine or card boxes that cost a mint. But the good news is that we can do high quality work for less. How can these boxes, perfect for corporate holiday gifts or personal gifts for the golf lovers you know, be so fine and yet so affordable? Simply put, we have the advanced equipment and materials required, and we carry out each design and production job with a commitment to excellence. So when you place an order for one or many boxes, engraved to your exact specifications, you get more than you expect. Many of our customers have been impressed to with our work and come back to us again the next time they need quality products at a fair price. If you are in charge of purchasing commemorative items for your next golf tournament, look no further than these Specialty Frames. Send us the black and while logo, graphics and text (make sure you proofread before sending!) and we’ll create picture frames attendees will be happy to take home. Our golf items also make great personalized christmas gifts. We have a variety of gift ideas for Corporate and Organizations. Whether it be for a employee of the month giveaway or a client appreciation gift we have ideas to get you started! Take a look! These finely crafted box's are an enduring way to show your appreciation. 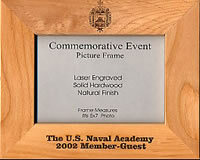 We can engrave your logo & even personalization with recipients name. Custom engraving is our business. These custom wooden frames are made of high quality red alder. Frames are ready for your logo, special message and almost anything else you can think of! 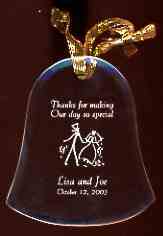 A great way to commemorate your special event! 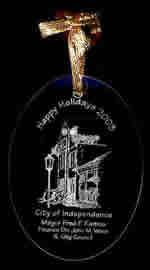 Click Above to Go to Ornaments Page! 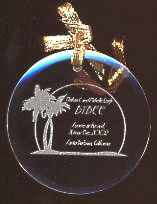 Glass christmas-ornaments! Great gift for all your employees or just the best ones! Custom engraved! Personalized your logo and saying! Corian Cutting boards, Plaques, and coasters! Your imagination is the limit! A great way to show customer appreciation!